TV show dates: June 12, 2017 — present. Performers include: Kal Penn (host), Mike Tyson, Dr. Rahul Jandial, and Christina Milian (panelists). An unscripted competitive reality series, the Superhuman TV show features regular people who have exceptional abilities in areas including memory, hearing, taste, touch, smell, sight, and more. The program hails from Endemol Shine North America. Rob Smith, Georgie Hurford-Jones, and David Friedman serve as executive producers. Each weekly episode showcases five contestants with superhuman skills, competing for a grand prize of $50,000. Their talents include hearing musical notes through colors, solving extraordinarily complex math equations in their heads, and feats of eidetic memory. 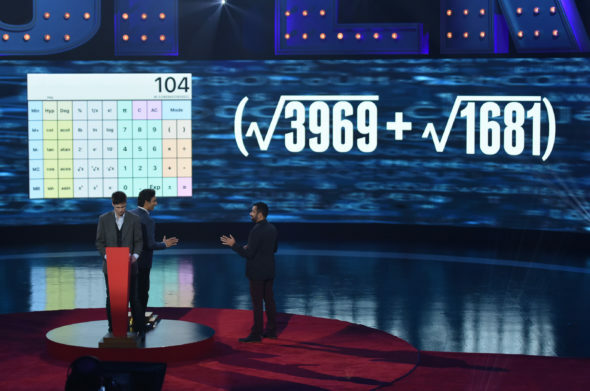 Host Kal Penn and panelists Mike Tyson and Dr. Rahul Jandial (who also appeared in the January 2016 special) and new panelist Christina Milian offer their insights and humorous observations about the competitors’ unparalleled abilities. What do you think? Do you like the Superhuman TV show? Should it be cancelled or renewed for another season on FOX? I enjoy it a lot! Although some of the contestants careers seem to enhance their abilities, I prefer those with more natural ones. It’s a show I actually hate to miss, so I’m glad to see it hasn’t been cancelled. How can you say this show is unscripted? There have been so many directing errors that prove that the show is rehearsed. For example, the show where the lady supposedly picked 3 items the judges had moved. In the supposed “live” portion she said that the Dr. had moved a binder. During the playback she said the red binder was green. When you watch this show closely, it is hard to believe what they are trying to sell us. RENEWED, I love this show. What happen ? Where did it go ? I love it, Is it on ? When ? Where? I love this show.I think the judges are perfect. I like the inclusion of an expert doctor in the panel. I love the show’s suspense. Please renew it. I love this show. I think the judges are perfect. ai lve the suspense. Please renew the show. Only saw the last episode. Really enjoyed it. Hope it’s renewed. Only saw Episode 8. Loved it and hope it will be renewed. Please do NOT cancel Superhuman!!!! One of the best shows ever!!! Superhuman should be renewed . I LOVE the show , always interesting and very entertaining ! Great show for families to watch !